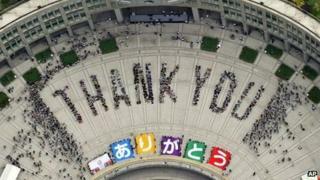 Image caption Tokyo celebrates - but what about the tsunami-ravaged north-east coast? For months journalists like me have been speculating on whether Tokyoites are really that enthusiastic about getting the Olympics. Well today we got our answer. As the announcement came through from Buenos Aires, venues across the city burst into uproar. I was at the Komazawa Gymnasium in the west of the city where a couple of thousand Olympic enthusiasts had stayed up all night. Japanese people are, by nature, quite reticent, but not this morning. As Jacques Rogge read out the name of the winning city they went berserk, jumping and shouting, crying and laughing. A few hours later, standing in the rain in Shibuya, the city's busiest shopping district, I questioned early morning shoppers coming out of the train station. The ecstasy may have been more subdued, but the sentiment was the same. Hard as I tried I couldn't find anyone who thought it was a bad idea. So much for my journalistic cynicism. Economists say Tokyoites have good reason to be cheerful. There's a lot of building to be done, and a lot of money to be spent. Like any Olympics, the centrepiece will be an extravagant stadium. Tokyo's has been designed by British architect Zaha Hadid. Its futuristic curves fit nicely with Tokyo's Olympic slogan: "Discover Tomorrow." But it comes at a huge price: more than $1.5bn. That is just a small part of the $8bn that will be spent on refurbishing old stadiums and building new ones. So it's all good news for Japan's construction companies, who have long been suckled on the teat of government spending. And then there are the people of Fukushima. A friend of mine who was born there could hardly contain her fury this week when she heard Japan's Olympic committee chief Tsunekazu Takeda reassuring the IOC about Fukushima. "Fukushima is a long way away," he said. "It is no threat to Tokyo." "No threat to Tokyo maybe," my friend said. "But what about the people who live in Fukushima?"